Miriam Neiger-Fleishmann looks at a memory of love in changing light. is the hour when shadows sharpen. their work done in desperate darkness. and protect the vial of oblivion. From Homer Beshetah Hefker (“Material in NoMan’s Land,” Hakibbutz Hameuchad, 2007). 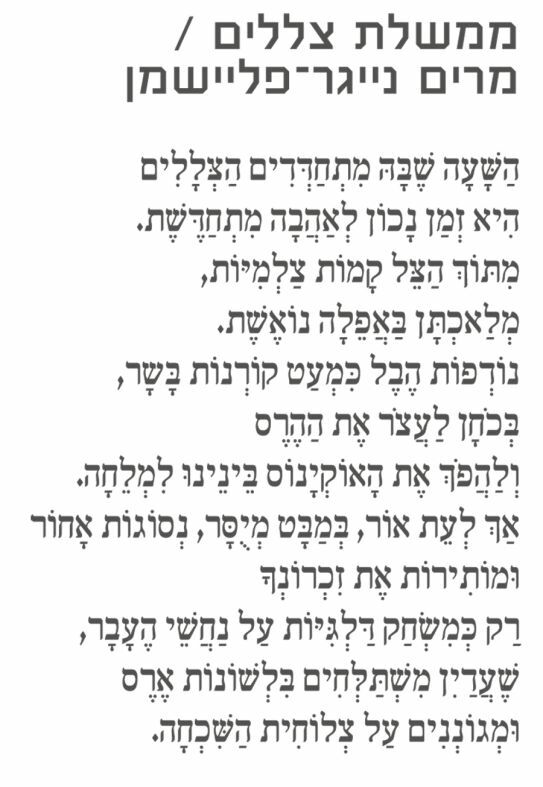 Co-translated from Hebrew by Anthony Rudolf and the poet. "The visual and emotional aspects of the love story are experienced in the totality of light and the absence of love mainly in the twilight zone," she says. "In a government where shadows rule, the archetype of ‘the shadow’ reveals the disturbing presence of the male and the female in our consciousness, and in the material world between a woman and a man. The poem clings to the wish materialized in the images of shadows acting independently of the vision and its creator. The “ocean between us” becoming a “salt marsh” captures the sensual quality of nocturnal intimacy in “desperate darkness” between two people who are not truly connected. The activity of the shadows is called “work” in line 4, while “like a skipping game with the poisonous snakes of the past” and “run wild” embody conjuring of the memories as play. Thus the activity of the shadow is again dual, both pleasurable and dangerous. Poet, painter and scholar Miriam Neiger-Fleischman was born in Slovakia in 1948 to Hungarian-speaking Holocaust survivors who brought her to Israel as an infant. She lives in Jerusalem, studied art at te Bezalel Academy and holds a Ph.D. in Hebrew literature from Hebrew University. She has published three volumes of poetry in Hebrew and one in Hungarian. 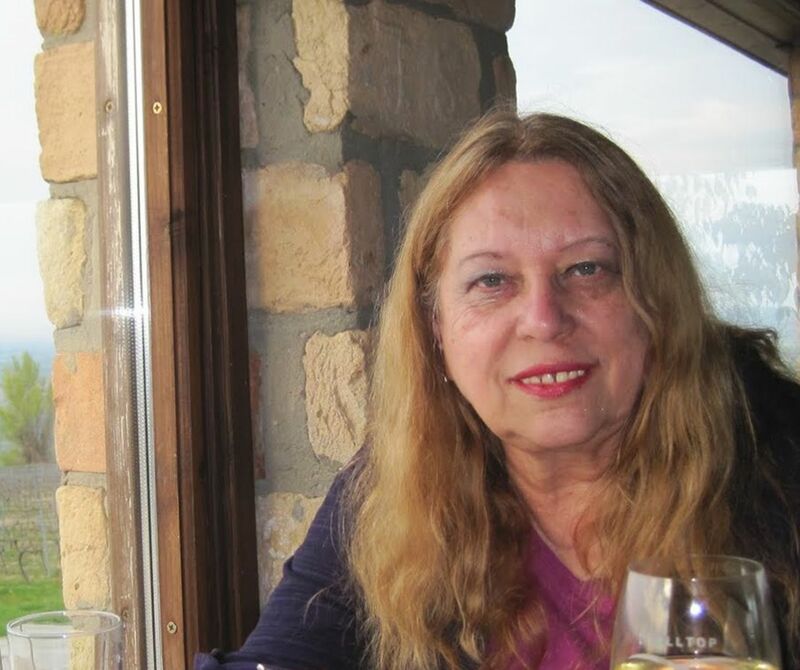 For many years she and Anthony Rudolf, a poet, memoirist, translator and literary critic who lives in London, have been co-translating her work into English. *Musing: If Israel had a shadow cabinet, what or who would be the male and female elements in it?